Giveit100 – what am I focusing on? I’m going to focus on healthy eating and making sensible food choices for 100 days. This morning I weighed myself. The scales read 67.2kg, which is 148lbs or 10st 8lbs. It’s not horrendous, but my goal weight is 10kg (22lbs) lighter, as I want to weigh 126lbs or 9st. I got down to that weight when I did Weight Watchers and I think it’s possible for me to get back there. I know that if I lose weight, I will find it easier to run and it should also help with my asthma. Which diet will I be following for Giveit100? I’m not following a set diet. My intention is to do my best to make healthy choices and to track what I eat. I’m not going to use an app like MyFitnessPal as I end up getting frustrated with how long it takes to find everything online. I’m not going to count calories and I’m not going to think about WW points. Instead, I intend to just write down everything I eat, so that I’m more conscious of what I’m putting into my body. I’m not going to share my entire food diary here, but when I do, please feel free to comment. I don’t always eat enough protein and I need to make sure that I get enough iron. What have I eaten today? Today started with 30g porridge (made with water, as usual) and some dried mango. I know dried fruit is quite calorific, but it tastes nice and is better than eating oatsosimple or some other ready-made breakfast. I also drank a pint of water. Since then I’ve only had a large mug of Earl Grey tea, so I should drink some more. I also had a couple of chocolates in the office (a Malteser and a Bounty from a box of Celebrations – oops!) I’m not going to beat myself up about this – I’ve managed to ignore the entire box of chocolate biscuits all morning. For lunch, I had a lovely salad. I decided not to have my usual salad with smoked cheese. 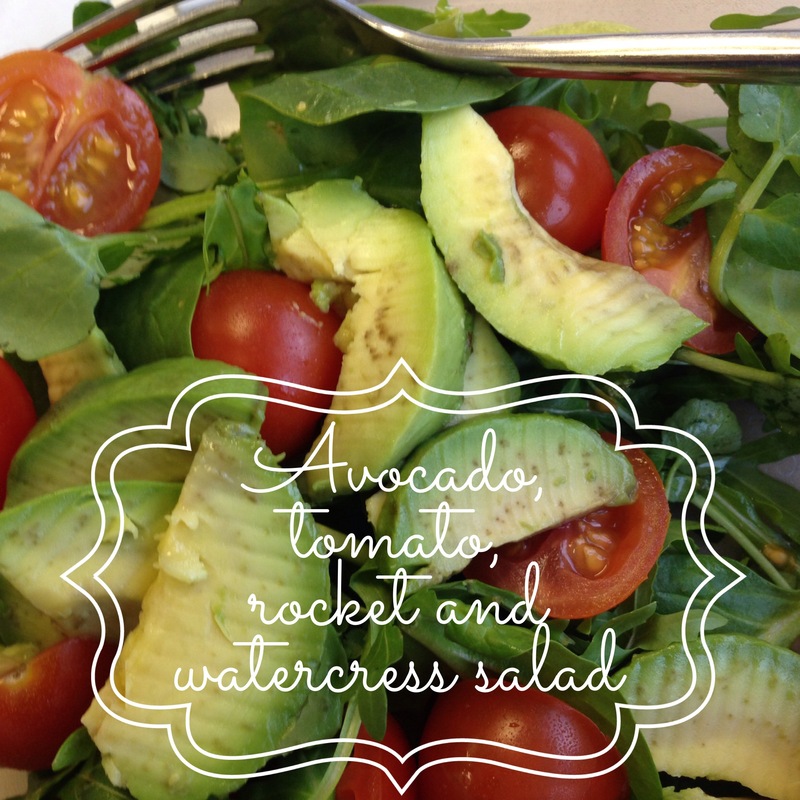 Instead, I opted for half an avocado with six cherry tomatoes and some rocket (arugula) and watercress. I’ve also got a couple of raw carrots and a small Granny Smith apple as snacks. I have a banana, but I might not eat it. For tea, I intend to eat some of the chilli that I made yesterday with some rice. I may eat a yoghurt later if I am hungry. Have you tried a Giveit100 challenge? I think avocado is probably a better choice than smoked cheese. As I crave something hot and comforting in cold weather, I’m making a lot of mixed vegetable soups. Yes, avocado is probably healthier and higher in protein, but I do like cheese. I intended to make some soup at the weekend, but then I got lured in by some lovely looking avocados. I have read a couple of recipes for avocado soup… but they all tend to include cream, which isn’t the healthy option I’m looking for, although I bet they taste delicious. Maybe I should try to make a spciy bean soup and then just add some avocado immediately before eating. I love your 100 day challenge for yourself! I don’t have any specific goals in mind for myself, but I do need to work on eating better too, and cleaning up my diet for a healthier happier life. Thank you 🙂 In December, I got sucked into eating a lot of junk in the office and I got so tired that I followed along with others who were doing afternoon chocolate runs, but that has to stop. I’m conscious that being overweight makes asthma more difficult to manage, so losing some weight should improve my overall health. I would recommend adding some protein to your breakfast. I have 40g of oats and 4 egg whites for breakfast! I used to measure all of my food and track calories/macros and I cut right down. I eventually realised (with help) that I was starving my body and slowing my metabolism. I still ate quite a bit but not enough for all the training I was doing so my body held onto anything it had. I use myfitnesspal and used to get frustrated, but the more I use it the easier it gets as a lot of the food I eat is the same week on week. A food diary in any form though, is a really good tool as it really makes younthink about what you’re putting in your mouth which leads to better decisions. I’m not a fan of the word diet as no food is bad in the right quantity, even doughnuts and currys! Seperately, of course!